The nation of Israel, at the time of our gospel story, was an occupied land. The Romans had invaded the land and controlled it. And in that context, we meet Zacchaeus, an Israelite himself, but also a tax collector for the Romans – a traitor of his own people, working for the enemy. And not just any Tax Collector, but the chief tax collector, meaning that he recruited and trained others. Try to imagine if you lived in an occupied country how you would feel about someone who took a job working for the enemy. Someone in the Ukraine announces, “I took a job with the Russian Government.” Or, someone in Iraq or Syria who suddenly announces, “I work for ISIS now.” There would be a lot of anger directed toward that person. That’s how people in the town of Jericho felt about Zacchaeus. But on that day in our gospel story, something different moved in Zacchaeus. Something caused him to want to see Jesus. A crowd assembled along the street, because they heard that Jesus’ was passing by. The other people, who hated Zacchaeus, who also wanted to see Jesus, were not about to let this little worm wriggle his way to the front. 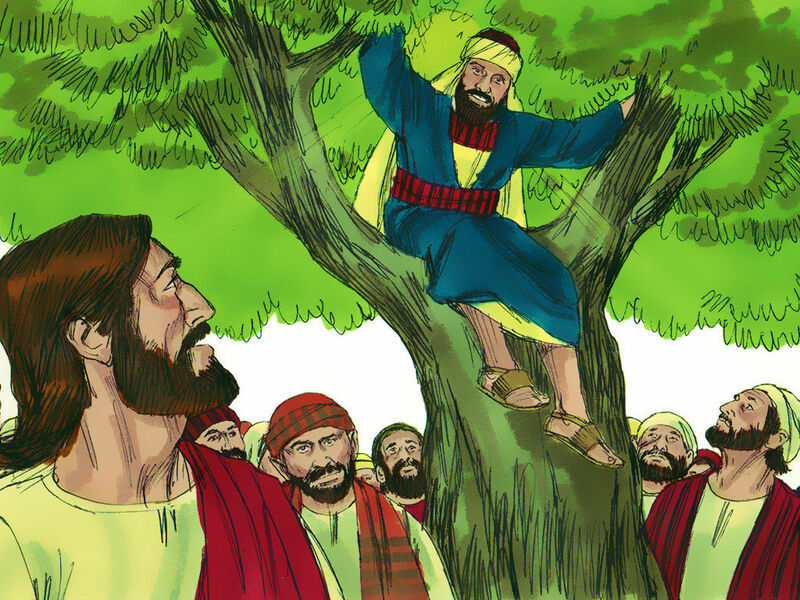 So, little Zacchaeus climbed a tree. Then it happened. As Jesus came by, he looked up, and offered Zacchaeus love and acceptance. Jesus called him to come down and told him that he would dine with him that day. Zacchaeus was not only thrilled, he was transformed. The truth that Jesus loved him and accepted him set him free. In joy and gratitude he announces that he will give half of what he has to the poor and that he will repay anyone he had cheated four times as much as he had taken from them. There are a few important things to see from this story. Here’s the first one: Sometimes we’re up a tree and don’t even know it. Sometimes we’re up a tree because we don’t recognize our need for forgiveness. We compare ourselves to crooks and criminals instead of comparing ourselves to Christ. We think God should accept us because we’re better than a lot of people. But that is not the basis of God’s acceptance of us – Instead, God accepts those who are humble enough to confess their sin, their shortcomings, and to ask for his mercy. Today is Reformation Sunday in the church. It’s a day when we remember a time, 500 years ago, when a pastor named Martin Luther, stood up and challenged a false teaching in the church which said that we have to do something to earn our forgiveness and acceptance before God. Luther said, “No, there is nothing we need to do to earn it.” We are simply invited to receive it with humble, honest hearts that know our need for God’s mercy and God’s help in our lives. It sounds so simple, and yet this idea has changed people’s thinking about God and about their lives ever since that time. And that brings us to a second important thing to see in our gospel text. God’s forgiveness, God’s acceptance of us, in Jesus, gives us the freedom to live for others. We have as our theme this year: “Abundant Joy, Overflowing Generosity.” This theme simply means finding our Joy in God, who through Christ has shown his great love to us and forgiven all our sins, and then letting that love and mercy overflow – like a cup filled to the brim and overflowing – letting that love and mercy overflow toward others. Because of what Jesus has done for us in the cross and Easter Resurrection, we no longer have to spend our energy and our effort trying to earn our forgiveness and acceptance before God. By faith in Jesus, our salvation is taken care of. We are now set free to invest our lives in love and mercy toward others. So we might ask How does that work for us? How does God’s love, in Jesus, set us free to live in love and mercy toward others? And so to illustrate how God’s love sets us free to be givers, I have this balloon. Without any air it doesn’t look like much and it isn’t good for much. But it can be changed and transformed with a little breath. his Word studied in Bible studies, (blow) his Word received through the sacraments, (blow) and through the assurance of his forgiveness (blow). And through the life he gives us, and his presence with us, we are filled with good things – gifts and abilities, talents and treasures (blow). Our faith tells us that everything we have is a gift from God. The world tells us to get as much as we can and keep it for ourselves, but Jesus calls us to give to others as he has given himself to us; the world tells us to look out for number one, meaning ourselves, but Jesus tells us that God is number one and we are called to serve God by serving others; the world tells us to be afraid there won’t be enough. God calls us to trust that he will provide us what we need and encourages us to share with others. Children are learning about Jesus, youth are growing in faith, youth and adults are active in serving, the sick are being visited, the grieving are being comforted, the hungry are being fed, people are being helped in time of tragedy and loss and need because of your gifts. Lives are being changed because of your giving and I thank you for that. Thank you for letting the joy you have received from God, in Christ Jesus, overflow in your generous involvement and giving to this church in ways that God’s mercy and love and ever present help can become known to others. In Christ, through Christ, and with Christ, we are a people of Abundant Joy and Overflowing Generosity. Let us pray: O God, we give you thanks for the love and acceptance you give us as a gift. Fill us with your gifts that we may be empowered to do your work in the world. Increase our joy in you, that it might overflow in generosity to others. In Jesus’ name we pray. Amen.